Motion Controls Robotics has in depth experience developing and installing press tending applications. These applications include: plastic injection mold machines, blow molding machines, thermal forming machines, brown board die cut presses and printing presses with automatic stacking equipment. 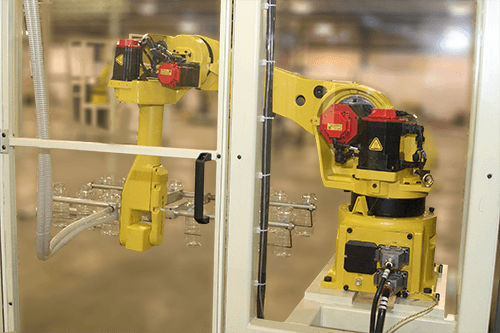 Motion Controls Robotics can help you develop a system to automatically unload your presses or take stacks of product from your presses and package the product, or move it to a downstream operation. We work with you to prioritize operations to be automated, develop a strategy to automate as your budget allows, or automate in larger steps in improve your return on investment. Motion Controls Robotics has developed and installed numerous robotic press tending systems; please contact us with information about your next planned automated press tending operation or to set up an appointment to determine feasibility and suitability of a robotic press tending solution for your current operations. 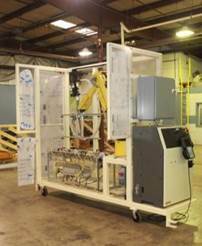 The Stand Up Bottle Take Away(SUBTA) work cell is wheeled up to a press, locked into position, quickly connected to utilities, and directed to unload specific bottles or other product based on operator selection on the HMI screen. When a press run is complete, the SUBTA can be moved to another injection molding machine while the first one is being changed over to a new product. A vacuum tool on the end of the robot removes large plastic parts from a plastic injection mold machine. Typical cycle times for these presses are in the 30 second range, sometimes allowing time for the part removal robot to do additional packaging or case packing operations while the press is cycling. Robot is mounted on top of the fixed platen to free up floor space and simplify operator access for mold changes. The robot is shown with an extension tube to improve reach for large mold cavities and flexibility of part unload operation. 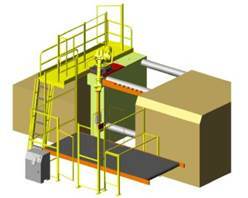 A floor level conveyor (shown) or an elevated conveyor that transports parts at a raised elevation to a decline conveyor outside the press area can be provided with the robot cell. Room for multiple tools can be provided inside the safety area of the robot for fast automated, semi-automated or manual tool changes. A simple menu interface for the operator, either on the robot teach pendant or on a separate HMI (human-machine interface) screen, allows for an operator to quickly and easily select what part is being run on the press and which tool to use on the robot. 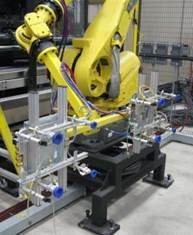 A key system is available to automatically determine whether the correct end of arm tool is attached to the robot when a part is selected from the menu screen. 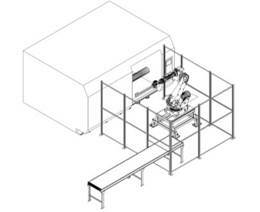 Safety interlocks ensure the press cannot close on the robot arm or tooling. Conveyor is typically used to move parts away from the press. The area where the robot operates is closed in to meet RIA safety specifications.